Get started with the special template that we've included. The template will help point you in the right direction, and provide some best practices for what content to include. Your requirements page might be laser focused on a particular feature, or it might include requirements for a release that includes multiple features. Either way, you should capture key high level details at the top of the page for easy reference. Participants: Who is involved? Use @mentions to include the product owner, and other stakeholders. Status: What's the current state of the program? Use the status macro to quickly show if you're on target, at risk, delayed, deferred, etc. Target release: When is it projected to ship? If you use JIRA, link to your JIRA project. The team goals and business objectives section is meant to give you a chance to add some color and context to your requirement. A good way to think about your goals is from your customers perspective. What exactly are they trying to achieve? How does the solution you're proposing fit into it? 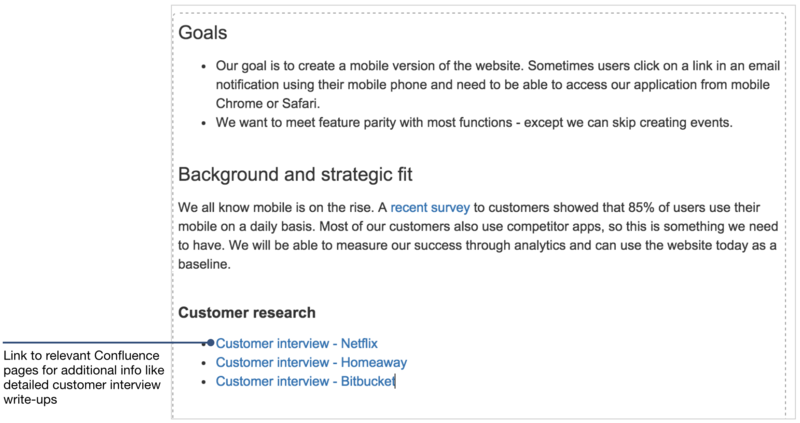 This is a great place to link to other Confluence pages to provide more detail including customer interviews, and planning pages. 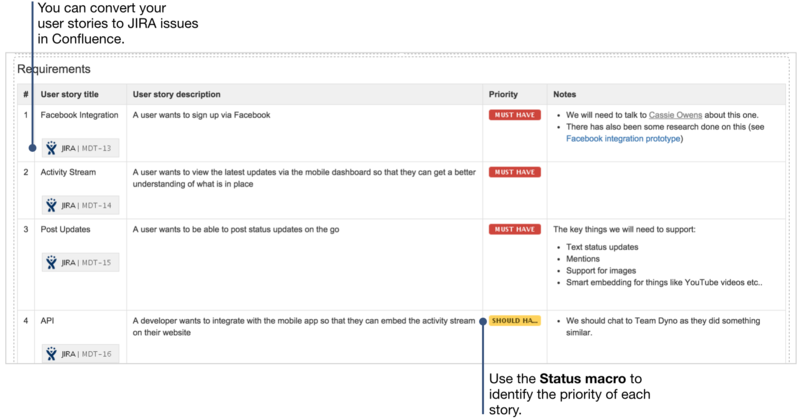 Use a table to list out your user stories, along with description, priority, and notes. This table is another great place to link to more detailed research pages, and customer interviews. It's really easy to turn the user stories you write in Confluence into JIRA issues. When the page is saved, just highlight the user story text, and Confluence will give you the option to create JIRA issues. If you have a full table full of user stories, you can convert them all into JIRA issues at once. Drag-and-drop design files to embed them on your page. If you're embedding multiple design assets use the attachments macro to create a quick repository of all the files that are attached to the page. Confluence is perfect for collaborating on wireframes, mockups, and design prototypes. Use the rich file viewer to prievew PDFs, images, and powerpoint presentations. You can pin comments directly on files to provide feedback in context. 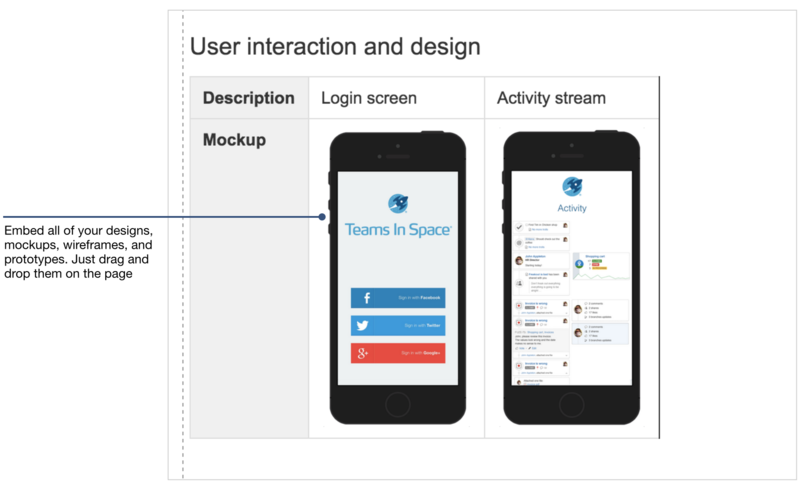 Your design, and dev team can spar on early mockups on the same page. Keep the team focused on the work at hand by clearly calling out what you're not doing. Flag things that are out of scope at the moment, but might be looked at later. Most likely you and/or your development team spend a lot of time in JIRA. 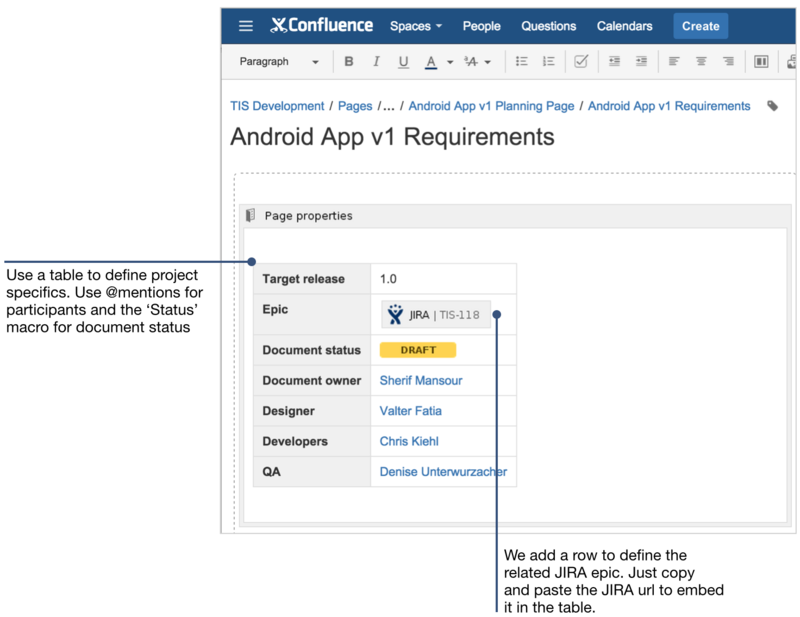 It's really easy to get from your Confluence requirement to your JIRA epic and vice versa. You can view all the JIRA links on any Confluence page, by clicking on the JIRA links button at the top of your saved page. You're probably not just working on one project. Confluence automatically creates an index page that pulls in the key details of all your team's product requirements. You can always access this index page in the Space sidebar. t's a handy way to see what your team is or has been working on at a high level. Just like any page in Confluence you can edit this index page as you see fit. You can edit the Product Requirements blueprint at any time and tailor it to fit your team's specific needs. If you want to edit the template for your specific team or project, go to the Space Tools menu and select Content Tools. Under the Templates option you can view and edit any of the templates included. If you're a site admin you can also edit the global template to customzie it company-wide. The key to agile requirements is buidling a shared understanding amongst your team. The best way to do this is creating your high level requirements doc in Confluence, and collaborating across development and design on crucial issues. Use our template as a guide, and customize it to fit your team or company's workflow. 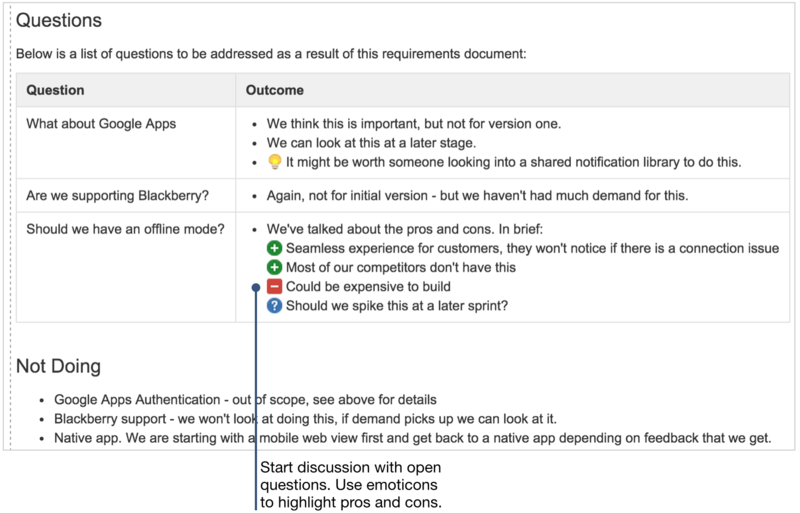 Product Requirements Blueprint: It does most of the work for you. Follow the page outline, and fill in content that makes sense for your specific requirement. Page properties macro: This macro makes it possible to create a reporting page across all your requirements. When using the blueprint it will be included on your page. Product Requirements index: Once you've created a few requirements pages, you can see all the high level details at a glance on an index page that Confluence automatically creates when you use the blueprint. 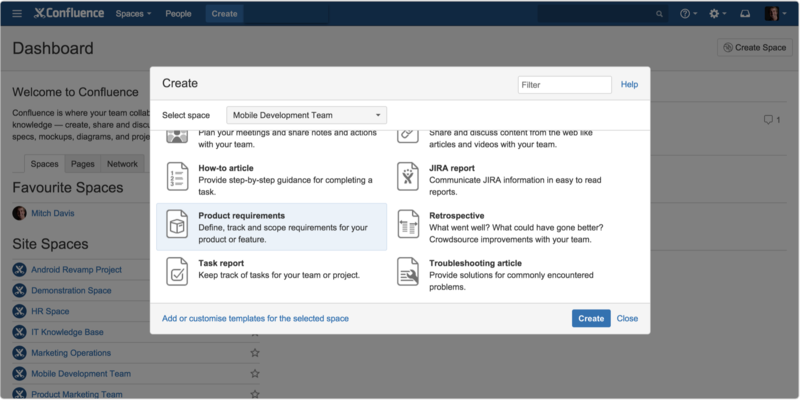 Create JIRA issues: Highlight text on the requirements page to quickly convert it to a JIRA issue. File comments: Add your design files to the page and encourage discussion on them with pinned comments. JIRA links: Just look in the page header to see all the JIRA issues that are included in the requirement. Customizing Blueprints: You can edit any of the blueprints that come included in Confluence to fit your specific workflow. Download the Software Team’s Guide to Confluence ebook to see all our tips in one place, then watch the blogs in this space to get notified when new tips articles like this are posted. And if that's still not enough, sign up for Confluence Insiders – our monthly newsletter covering all things Confluence.